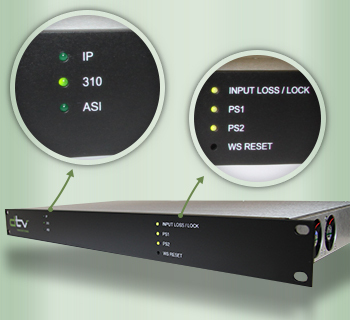 The TSC-6000 is a robust transport stream format converter (TSC) and is compliant with both ATSC and DVB standards and is ATSC Mobile DTV Ready. It converts transport streams between ASI, 310M & Transport Streams over IP (TSoIP) formats. It accepts all three formats and will output all three formats simultaneously. It is controlled via a web server user interface and allows the user to configure and monitor the unit status. Adhering to the concept of our TSC family of products, the TSC-6000 is designed for easy operation. The TSC-6000 has GPI/O, dual power supplies for reliability and is field upgradable. Transport stream encapsulation, forward error correction and UDP/RTP de-encapsulation as defined by the SMPTE 2022-1 specification.